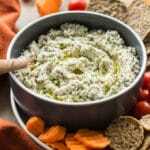 I’m not vegan, but this dip looks superb! And the rosemary crackers are so pretty! Do you mind sharing the name of them? Thanks Mimi! 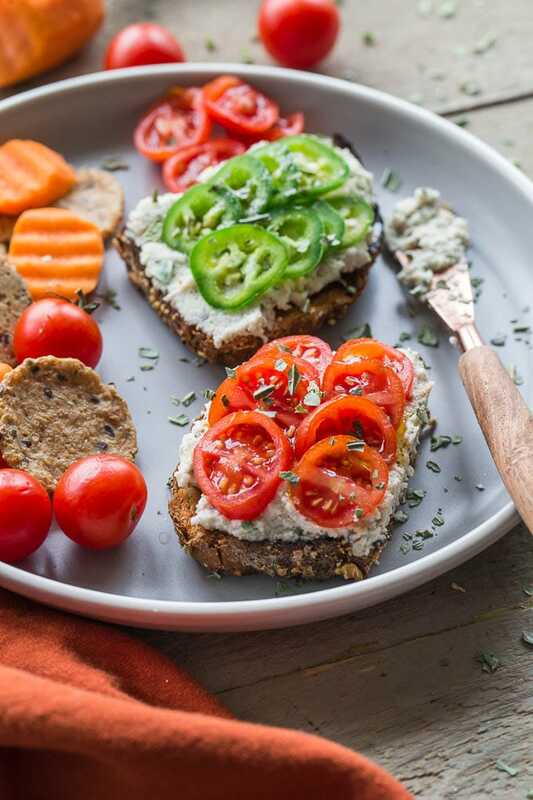 My hubby and I aren’t vegan either, but we try to go dairy-free quite a bit, which means some of my recipes end up being vegan.The crackers are my latest snacking obsession. They’re Oh My Yummies! Thanks Dawn! Funny that the holiday snack tray stands out as a childhood holiday memory! No wonder we turned out to be foodies! Gotta love the creaminess of cashews. I can’t believe it took me so long to discover their versatility! Hope your week is off to a great start! That dip looks sooo yummy! Perfect for any weekend or holiday for sure! YUM! I need to go easier on the dairy these days too and since I love snack food I need to give this a try! 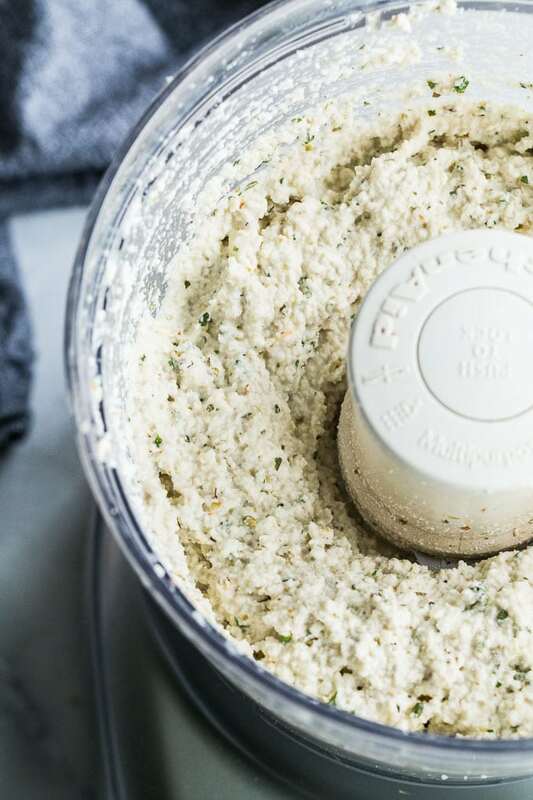 I’ve never tried cashew cream-based foods or sauces so I’m intrigued! Thanks Marcie! The cashews create such a creamy base. It’s definitely worth a try if you’re cutting back on dairy! I can’t wait to try this Leanne. I bet it’s delicious. Perfect for the holidays ahead! Thanks Mary Ann! I’ll definitely be whipping this one up over the holidays for sure! 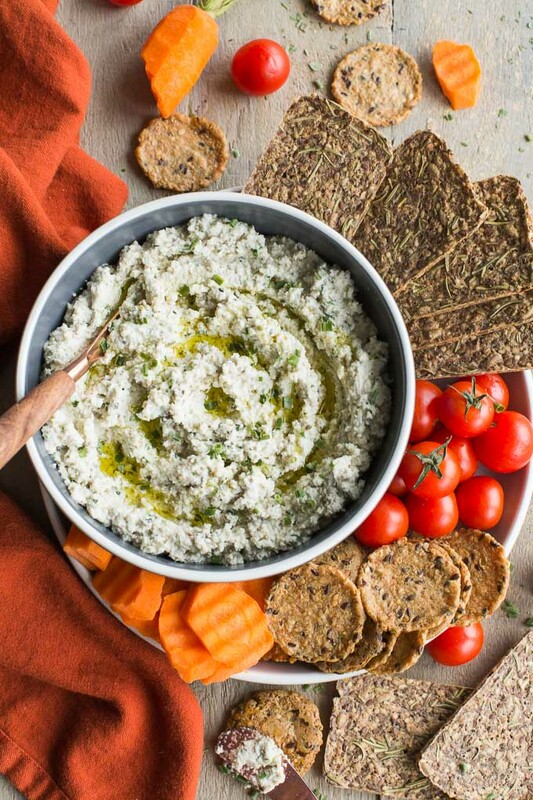 That dips looks amazing for a holiday spread! I want to dig right in!! Nothing like a good dip! Especially this time of year! Pinned! Thanks so much Annie! I always like to have a dip ready to go in the fridge. Thank you for pinning! Very interesting! 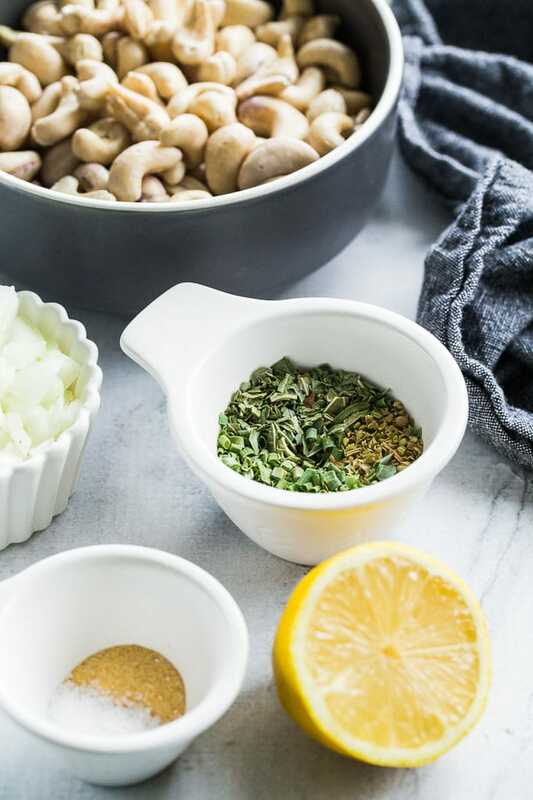 I’ve never thought at cashew, onions and herbs together. Definitely to try! Thank you! I hope you like it. Be sure to let me know what you think! 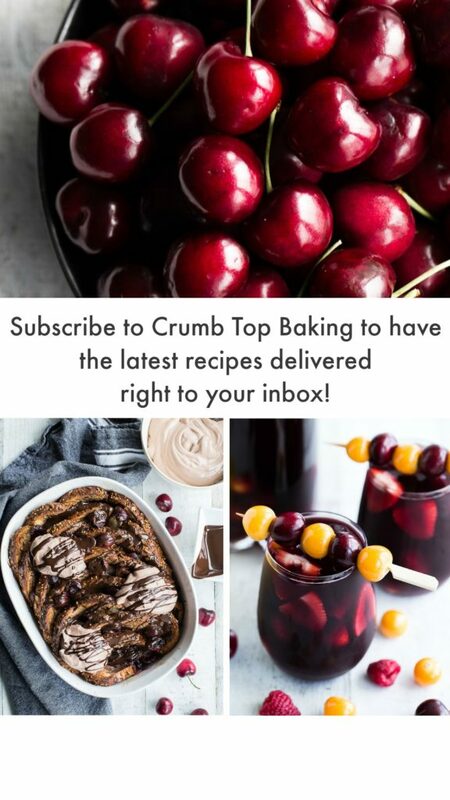 I meant to visit this recipe as soon as I saw it on IG but somehow it slipped my mind and now I’m kicking myself for not checking it out sooner. Because YUM! OMG this looks so good, Leanne! 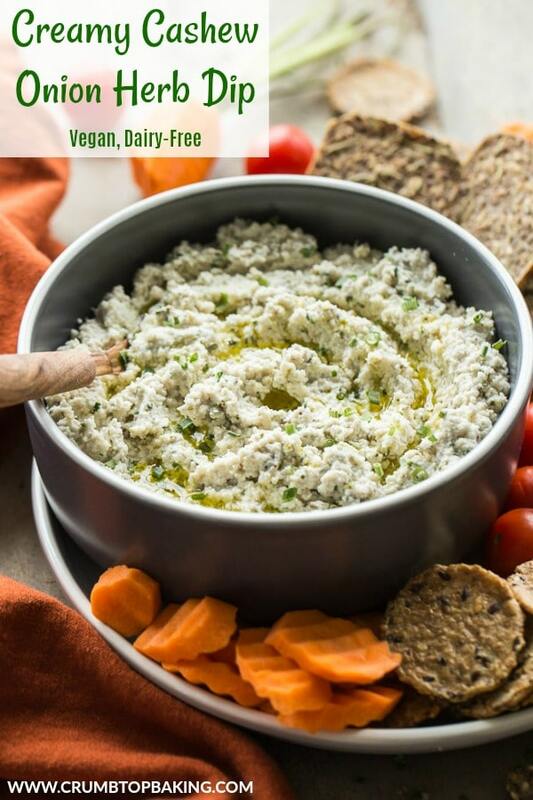 I always do several different dips at the holidays so everyone has something they can enjoy, and this would be perfect for my friends who can’t do dairy. Love it! Thanks Kelsie! 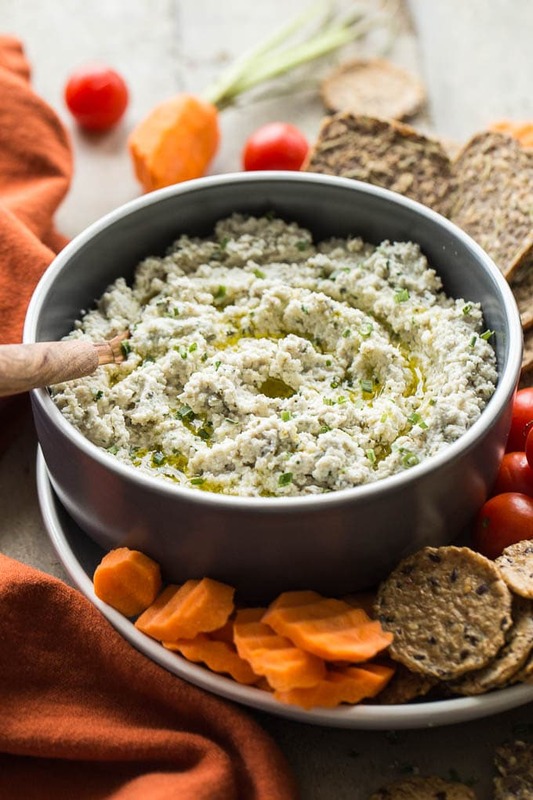 I love having a variety of dips to serve over the holidays too! And I’m definitely drawn to the dairy free option! Mmm! My daughter can now have cashews so I would love to try this! Yum! That’s awesome Corinna! I hope you get a change to make it, and I hope your daughter likes it. Thanks! Holy heck! This looks and sounds so amazing. I am pinning this for later. Definitely making it soon 🙂 Thank you for sharing your recipe. Thanks so much Jo! Hope you get a chance to make it. I would love to know what you think if you do! I absolutely love this more health-conscious approach to onion dip. I am always looking for healthier alternatives to classic snacks and apps, thank you for the inspiration Leanne! No problem Yvonne! Thanks. We love snacking in our house, so I try to come up with healthier alternatives as much as possible! Thanks Terri! I hope your co-workers like it as much as we do! Superb! Fabulously delicious side dish. Thank you! We mostly eat it as a dip, but a side dish works too!